George Graham Reviews Ben Sollee's "learning to Bend"
If there is any instrument that epitomizes classical music, it's the cello. Of the string instruments, the violin becomes the fiddle in folk, bluegrass and country music. The acoustic bass is indispensable in jazz, and the viola tends always to take a supporting role. The cello, though, is a key part of orchestras, string quartets, and the inspiration for many a cello concerto and sonata. But you haven't often seen a cello in a pop band. Lately though, the cello is beginning to take its place, perhaps tentatively, in the rock, folk and jazz world. In the past few years there has been the creative folk group Crooked Still, with their prominent cello, Lindsay Mac, a singer-songwriter cellist, Invert, the creative and definitely not-classical string quartet with two cellos, who have appeared on our Homegrown Music series. Also, the duo Bethany and Rufus, featuring Bethany Yarrow daughter of Peter Paul & Mary's Peter Yarrow and cellist Rufus Cappadocia put their spin on traditional folk songs. And there have been at least two all-cello rock bands, Rasputina, and Apocalypica who performed Metallica tunes on cellos. 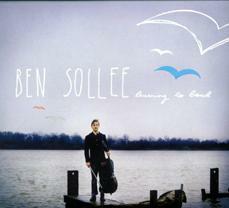 This week, we have a distinctive artist whose instrument is also the cello, Ben Sollee -- a singer-songwriter cellist. His debut full-length CD is called Learning to Bend. Ben Sollee, like many people who bring the cello into the non-classical world, did come from a classical background. But the 24-year old Louisville-area artist has already had an eclectic career. For several years he has toured and performed with bluesman Otis Taylor, in a rather unusual blues band with electric guitar and cello. Sollee was also a part of a group called the Sparrow Quartet, with banjo virtuoso Béla Fleck, which toured in China. But Learning to Bend features Sollee's own songs and his rather distinctive style. The songs are interesting to begin with, both musically and lyrically. And they are made all the more absorbing by the prominence of the cello, which he bows and also strums and finger-picks like a guitar. He plays a real guitar from time to time as well. His group also sometimes features the vibes, another instrument intimately associated with different genre, jazz. Sollee has an appealingly unpretentious soul-influenced vocal style, which fits in with the relaxed, informal, often intimate sound of this CD. Sollee writes about love, including relationships growing and breaking, and also addresses the state of the world. He also does a cover of a Sam Cooke song in which writes new updated lyrics to make them more topical. Two other members of the Sparrow Quartet join Sollee, including Fleck on one tune, and vocalist Abigail Washburn. The personnel varies quite a bit from one track to the next, but the instrumentation always sounds intimate, even when there is a regular string quartet who makes a couple of appearances on the CD. Ben Sollee's new CD Learning to Bend is a fascinating and quite enjoyable recording from a creative and original singer-songwriter cellist. The fact that he plays the cello immediately makes for a sound that's out of the ordinary, and he adds additional eclectic instruments. He creates some interesting material to go with the distinctive sound. He is a worthy lyricist, and his songs would stand on their own even without the unconventional instrumentation. Sonically, we'll give the CD close to an A. The recording has a nice intimate but live quality that sounds unpretentious and real. There is little apparent overdubbing, and studio effects are at a bare minimum. There is also a decent dynamic range that lets the music ebb and flow in volume. The cello is probably not destined to replace the guitar in pop music any time soon, but increasing numbers of musicians outside of the classical world are doing interesting things with it. Ben Sollee's Learning to Bend is a stellar example.